Emily Blunt looked practically perfect in every way as she celebrated at the world premiere of her new film, Mary Poppins Returns. Following the legacy of iconic 1964 music adaptation, Mary Poppins Returns portrays The Devil Wears Prada actress Emily Blunt as the magical nanny. Blunt has been appearing in different events to promote the Rob Marshall remake. On her latest blue carpet appearance, Emily commanded attention as she coordinated her dress with the theme. The 35-year-old actress strutted in the venue in a sweeping blue silk gown paired with diamond drop earrings. The Golden Globe winner added a boost to her height with red peep-toe shoes. Emily wore her hair in soft sleek curls and complemented her fair complexion with a rosy makeup look and pink lipstick. The floor-length dress hugged Emily's slim frame and featured an elegant neckline, modest trail and cuffed sleeves. 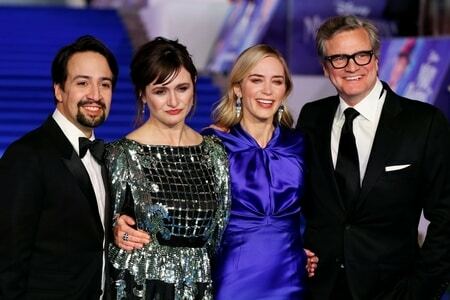 Emily was joined by co-stars Emily Mortimer, Ben Whishaw, Lin-Manuel Miranda, Colin Firth, and Meryl Streep as they posed for photos at the star-studded event. For the premiere of the movie, The Royal Albert Hall was transformed into the iconic Cherry Tree Lane from the upcoming film, which is based on the famed 1964 musical adaptation of PL Travers’ Mary Poppins stories. A long blue carpet, flanked by street lamps and flourishing pink cherry blossoms, led up to the entrance of the concert hall which had been turned into the house from the beloved film in the perfect homage to the 1930’s London setting.